When Jim is not painting in his studio, he enjoys many other hobbies and interests. His love of art is carried over into the love of music also. Since he was a young boy, he has played the clarinet. He plays regularly with several jazz musicians in Southeastern Tennessee and Northwest Georgia. He also enjoys riding around the country in on his Harley Davidson motorcycle. Some of the rides that he enjoys most are the annual “Trail of Tears” that begins in Chattanooga, TN and ends in Waterloo, AL. 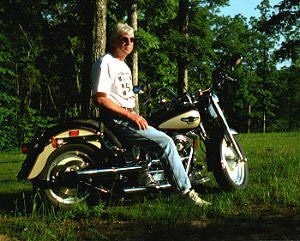 Jim has already done two pieces featuring Harley Davidson motorcycles titled Memphis Blues and Unforgettable. There will be more upcoming series featuring additional cycles from Harley Davidson. 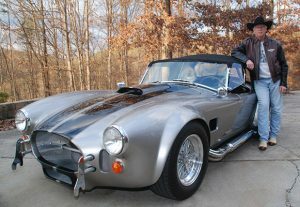 Jim purchased his 1966 Shelby Cobra roadster shortly after finishing his painting of another Shelby Cobra – ” ’64 Lemons.” After meeting Bob Baurdront at the 2009 Ohio Cobra Show in London, Ohio, he plans to paint other various show cars and automotive art in the near future. When he can find the time, he enjoys traveling out west. In the Summer, he retreats to his land in Zortman, Montana, where he has known to tame a snake or two. Jim also has a love for Corvettes. 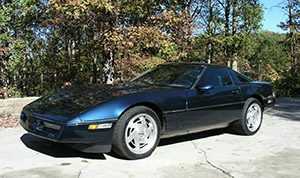 After acquiring a 1988 C-4, he has been inspired to research several projects where he will be putting some of these beautiful automobiles on canvas.